While the film is a real departure for the actress, who won an Oscar for vividly depicting the highs and lows in the life of Edith Piaf in “La Vie en Rose,” it fits squarely within the Belgian brothers’ oeuvre, both thematically and tonally. The Dardennes long have championed the common people–found honesty and elegance within their daily struggles–from “La Promesse” to “The Son” to “The Child” to “The Kid With a Bike.” Their latest follows a wife and mother of two as she fights to win her factory job back. But with “Two Days, One Night,” the main difference is that the writing-directing brothers have taken a major, international celebrity and placed her within their familiar tracking shots, long, urban walking tours and natural lighting. It may sound like a gimmick: “Oh, Marion Cotillard, she’s so brave for running around town with no makeup and a messy ponytail.” But Cotillard can be an exquisitely subtle actress, with expressive eyes and a face that are made for quiet suffering. 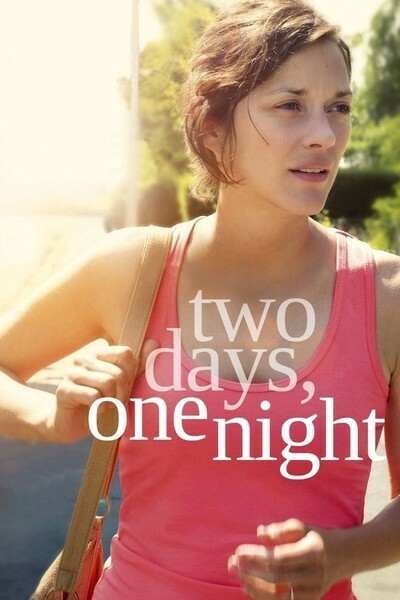 Even when “Two Days, One Night” drags a bit, Cotillard’s performance remains compelling. In retrospect, her character here isn’t all that different from the role she played in the other film that’s earning her great acclaim this year, James Gray’s “The Immigrant.” Both women find themselves in a predicament in which they must fight to maintain even the most meager standard of living; both make decisions to protect their family members which expose them to shame and humiliation. But whereas Gray’s film is lush with the old-world costume and production design of a century ago, the Dardennes remain within their comfort zone of stripped-down, modern realism. They throw us right into the middle of things, though, and challenge us to keep up. For a while, it’s unclear what has happened to Cotillard’s Sandra–why she is napping on the couch in the middle of the day when the phone rings and wakes her; why the call she receives startles her into action. We must piece it together over the time period that gives the film its title. We eventually learn that Sandra has been on leave from her manufacturing job for reasons which remain unspecified but clearly have to do with her mental health. (A great deal of pill popping goes on over the film’s brief running time.) She shares a modest townhouse with her loving husband, Manu (Fabrizio Rongione), a restaurant kitchen worker, and their two sweet-natured children. But they also need her income to make ends meet. So when a co-worker calls with the news that she might have a chance to come back, she’s immediately encouraged; despite her lethargic state, it’s obvious that her job has been a source of identity and pride. But here’s the problem: Sandra’s co-workers all have agreed to receive a bonus in exchange for her dismissal. The only way she can return is by persuading a majority of them to sacrifice the 1,000 Euros they’re expecting in order for the company to afford to retain her job. The situation seems inordinately sadistic and more than a bit contrived; however, that’s what sets the film’s plot in motion. Over the course of a weekend, Sandra must hop on buses and hoof it across town to knock on the doors of the 16 people who will decide her fate. In her understated uniform of racer back tank tops (with colorful bra straps sticking out) and tight jeans, she has the same conversation over and over again–or, at least, she begins the conversation the same way. The mystery of how each person will respond provides what little tension exists here and brings life to the film’s somewhat repetitive rhythms. Unsurprisingly, they’re all in similar financial straits. They all have their reasons for needing the 1,000 Euros. Some are sympathetic to her plight and agree to vote in her favor while others are unmovable. “Don’t take it badly,” one woman says as she sends Sandra off with a “no” and a kiss on the cheek. But the cumulative effect of these exchanges builds momentum, sneaks up on you and leaves you rooting to see her succeed. Having said that, the film’s conclusion might upend your notions of the definition of success. The film's power comes in the form of quiet revelations, as is the Dardennes' signature style.